With an album titled Welcome the Worms, you wouldn’t immediately think that a track titled “Sour Candy” would make the cut. Welcome the Worms sounds very metal — unless the worms in question were gummy worms. One look at Bleached, however, destroys the gummy-worm hypothesis. Bleached is sisters Jen Clavin (vocals, guitar) and Jessie Clavin (guitars) with bassist Micayla Grace and drummer Nick Pillot. Welcome the Worms, released April 1 via Dead Oceans, is the group’s second album. The album cover hints at Bleached’s duality—it features both Clavin sisters and bassist Grace striking dramatic poses in the middle of the desert, which are juxtaposed with their scowls. Though their hair might be any range of pastel colors, these are girls who you wouldn’t dare tell to smile (not that you should be telling anyone to smile). That’s how Welcome the Worms track “Sour Candy” functions. Originally released as a single earlier in March, the song is a perfectly-balanced blend between pop and punk that has listeners reevaluating what those genres mean. Pop? Punk? Pop-punk? 80’s girl-band pop-punk-influenced indie? How did we even get that nuanced a genre? The track’s title is perhaps representative—just like a Gobstopper or a cherry Sour Patch Kid, “Sour Candy” is a right-on-the-money mix of sounds both old, new, and cross-genre. “Sour Candy” starts off with what sounds like either whirring or liquid being poured into a red Solo cup. There’s also a distinct sound of a car starting—perhaps a nod to the group’s LA roots—as well as coughing and muffled, indeterminate speech. Which launches immediately into a sunny, Bryan Adams-y guitar riff. The ambiguous ambient sounds at the song’s beginning are completely forgotten as Jen Clavin’s vocals come in, faintly reminiscent of Belinda Carlisle. As the song progresses, so does the feeling that this could easily be The Go-Go’s or The Bangles—had either of those groups had a dark side (see their song “Chemical Air” as evidence). Unlike their predecessors, Bleached don’t shy away from explicitly referencing the rock n’ roll lifestyle. Within the second verse of “Sour Candy,” Clavin references “smoking in dives” and “getting high,” which progresses (naturally?) into “picking flowers on LSD.” It’s the lifestyle of a classic rock n’ roller: One can easily imagine an early 1980’s version of the band rolling down Sunset with Joan Jett and the crew. These references could easily come from the band’s dark period, where struggles with drugs and partying somewhat clouded the members’ direction. However, like the band, the speaker finds a way out. The nearly-shy lyrics in the bridge (“never really was the talking type, til I stumbled on some crazy nights/ What in the world was I thinking when I said hello?”) contrast brilliantly with the hard partying mentioned in the previous lyrics, and set listeners up for the ridiculously-catchy chorus. While the relationship hinted at might not work out — as Clavin is soon washing down their “conversations” with “cheap whiskey and sour candy” — the song’s emphasis on the fact that the opposite party is the one “missing out” remains with each iteration of the chorus. Though the sound in “Sour Candy” is upbeat and fun, the harder lyrics wouldn’t be out of place in a hard-boys-only punk band’s song. And the fact that the beat is catchy poses no problems for Bleached. As Clavin belts “rock n’ roll is good for people like me,” listeners are drawn to believe her belief in rock—that it really is a genre that ought to be good for and open to everyone. With the pop-punkability of acts like The Gogo’s and Joan Jett & the Blackhearts behind them, Bleached’s evocative sound and unflinching lyrics prove that they more than deserve to be considered as both a pop and a punk band. The band’s sweet (pun absolutely intended) duality comes with images like these–picking flowers while on drugs, conversations tossed back down the throat by “cheap whiskey and sour candy.” It’s sugar-drenched without being sugary, and it is Bleached being unabashedly and unapologetically themselves. “Sour Candy,” like many of the songs on Welcome the Worms (“Chemical Air,” “Wednesday Night Melody”), manages to balance pop and punk rock n’ roll, so much so that after listeners have managed to stop singing along to “I’ve been givin’ in, into givin’ up,” they’re left scratching their heads once again as to what genre this could fit under best. Which is why Bleached’s music — and “Sour Candy” in particular — works. Their lyrics are simultaneously fun and unflinchingly honest (“the past ain’t kind and the future scares me”; “what in the world was I thinking when I said hello?”), and that spirit extends to much of their work. Here is a band that isn’t afraid of sounding like a pop band and sees nothing wrong with wanting to be one. No matter how many pretentious indie “purists” weep and wail about the “loss of art” around them, Bleached are unafraid to stay true to themselves—and news flash—that’s what the whole “indie mystique” is about. 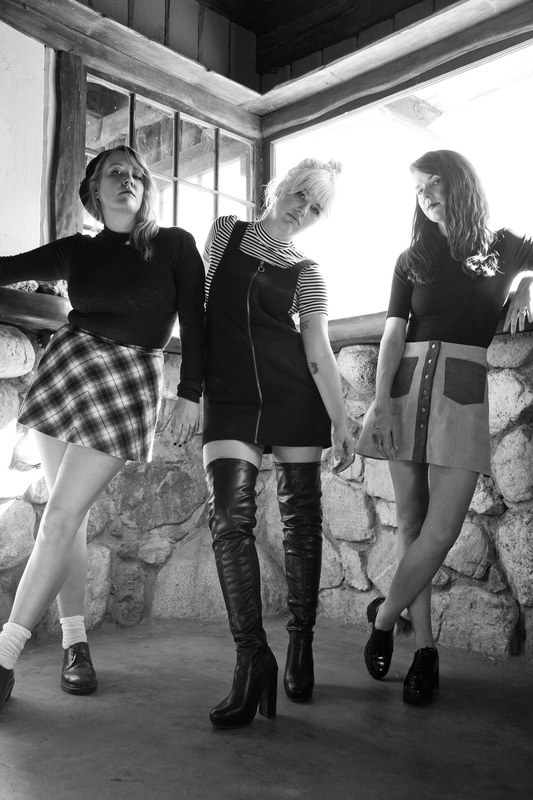 Bleached’s confidence and attitude are what makes them stand out, and “Sour Candy” is a perfect example of their ability to blend both pop and punk to create a uniquely sweet-and-sour sound.